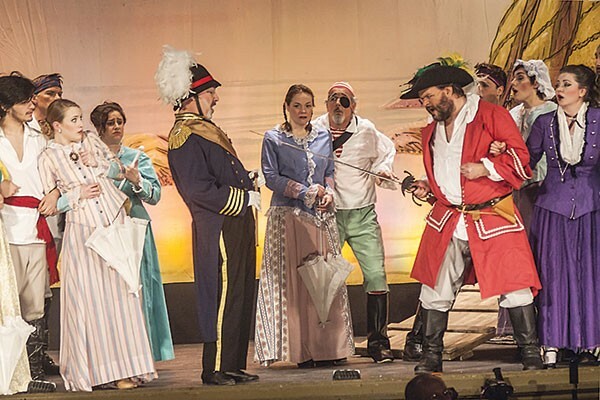 A time-honored classic of the Gilbert and Sullivan canon, The Pirates of Penzance is the perfect operetta for purists and newcomers alike. The story is simple: It’s the 21st birthday of pirate apprentice Frederic (Alec Donaldson), which means his tenure to the pirates has come to a close. Due to his abiding sense of duty, he’s now committed to exterminating his former comrades for their errant ways, though the men are far too raucous and jubilant to worry about any impending doom. While the merry cast of pirates chew the scenery with glee, the show gains its footing with the arrival of General Stanley’s daughters. Led by the brazen Mabel (Elizabeth Rishel), the sheltered girls hold their own alongside the roustabouts, adding a much needed zing of charm and wit to an occasionally predictable production. The Pittsburgh Savoyards last performed this perennial favorite in 2012 with some of the same actors in the roles. In this rotating cast, opening night featured standout performances from Leon S. Zionts as the manically honorable Major-General Stanley, and Bob Herold as the craven Sergeant of Police. Candice Shaughnessy also shines as Ruth, Frederic’s incompetent yet lovable nursemaid, who accidentally apprenticed her charge as a pirate instead of a pilot. Behind the scenes, stage director and choreographer Sean Lenhart does a capable job at corralling the sizable cast in his first show with Pittsburgh Savoyards. Likewise, music director Guy Russo conducts the pitch-perfect Pittsburgh Savoyards Orchestra in inspired renditions of more than two dozen songs. 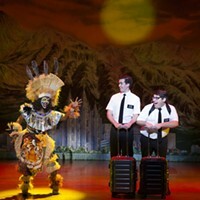 Overall, the production takes few chances with the tried-and-true material, but the result is a show that hits all the right notes. 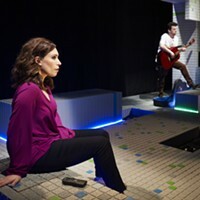 There’s not a weak voice in the house, and although the huge cast does at times muddy a few stray lyrics, the surtitles projected above the stage buoy the audience through any ambiguous choruses. 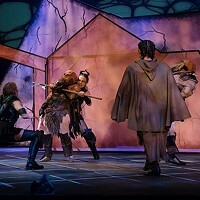 Perhaps it’s not the very model of a modern theatrical interpretation, but this Pittsburgh Savoyards production provides a highly entertaining evening nonetheless. The comments on this article were severely off-topic and contained personal attacks. Therefore, we have deleted the comments and closed comments on this story.